This is a 3 axis compass; It's an i2c device with an address of 0x1E. 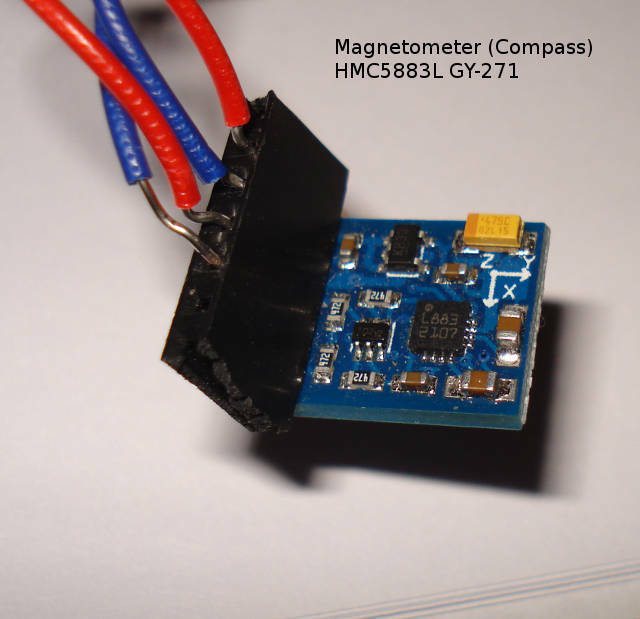 Compass HMC5883L (badly wired up). 5V, GND, SCL to A5 and SDA to A4; ignore random cable colours. This is the code that I used; it certainly seems to work, but I will be doing much work on the programming as it gets incorporated to me quadcopter project. Looking at the output, I can see when to compass is rotated, my heading (in degrees) changes between 0 (North), 180 (South) and 360 (North), and all the compass points in between. At the moment, thats all I need to be confident of connecting it to my quadcopter and ensuring it consistently points in one direction. The angle will also change as the quadcopter is tilted; my accelerometer is next, and should provide data to modify this compass reading during quad tilt.